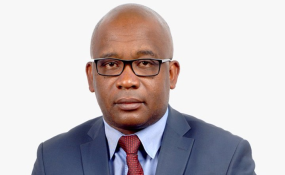 The Grain Millers Association of Zimbabwe (GMAZ) Chairperson Tafadzwa Musarara. The Grain Millers Association of Zimbabwe (GMAZ) is appealing to Government to temporarily suspend shop licensing laws to allow more middlemen to distribute stock from the millers. GMAZ chairman Tafadzwa Musarara said this during a tour of grain milling companies in Bulawayo on Tuesday. His call comes amid fears that some of the stock held by the local millers could expire due to limited uptake by retailers following last week's illegal and violent protests that saw many retailers in the high density suburbs emptied by looters who also went on a spree vandalising the retail outlets and other infrastructure worth millions of dollars. Mr Musarara said local millers have stockpiles of products that need to be dispatched to the consumer to allow continued production and supply to the market for the industry not to encounter loses. "What happened in the past week is quite unfortunate because it disrupted the flow of agribusiness and also affected numbers of maize meal stocks. "In spite of the unfortunate events, millers have enough stocks to meet the nation's growing demand for maize meal," he said. "As millers we are now appealing to our Government to help us as millers to distribute our stocks to the consumer since shops in the western suburbs were destroyed to the ground. "We need a middleman between us and the consumer and for now we are asking if it is possible to suspend shop licenses so that we can sell to anyone willing to get the product to the consumer." The tour, which was facilitated by GMAZ, was also attended by Bulawayo Provincial Affairs Minister Judith Ncube. Four millers in the city namely Sunset, Blue Ram, Blue Ribbon and National Foods were visited. Minister Ncube said Government was working on ways to deliver basic commodities among them, mealie-meal to areas that were affected by the violent protests. Mr Musarara condemned the protests, which were characterised by violence saying this negatively affected business and innocent people. "The milling industry has nothing to do with the protests but we've lost because shop-owners have been attacked. "We're still to recover from that shock and we can't comprehend it. "We support the Government of the day and the burden of providing food security rests with the Government in terms of the Constitution, and of course we've been licensed to provide those services." As a result of the violent protests, the country's milling industry has lost stocks worth $3 million.